Photos and information on the CPR in Gleichen. 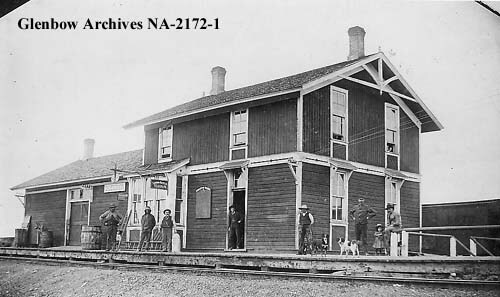 The original station opened in 1887 and was located on the north side of the tracks in 1899 it was closed moved southwest of the tracks and converted into the section foreman’s residence. There were freight sheds on west end; also used for church services and social gatherings. According to the Glenbow, Victor J. Beaupre is the one third from the left. 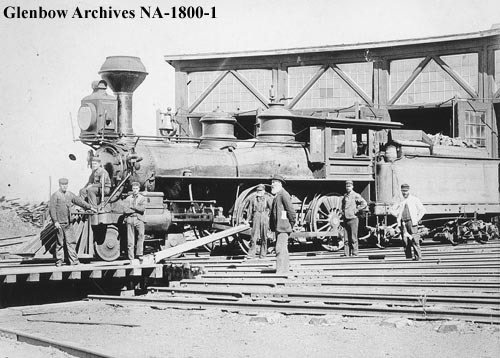 Gleichen also had a roundhouse and turntable in it’s early days. The following picture is also from 1885. Joe Didsbury is on the extreme right in the picture he was the car inspector for Gleichen.